A woodcutter, Persons was accused of murdering a white woman. He was arrested and released two times before he was eventually beaten into a confession. A local mob captured him and burned him alive in front of thousands of spectators. The students of SUM felt the need to restore justice so they organized one of Sunday’s two commemorations, where they unveiled a historical marker at the site where Persons was murdered. Following that, they then gathered with the Memphis Lynching Sites Project of Memphis (LSP), The National Park Service, and the NAACP for an inter-faith prayer service. 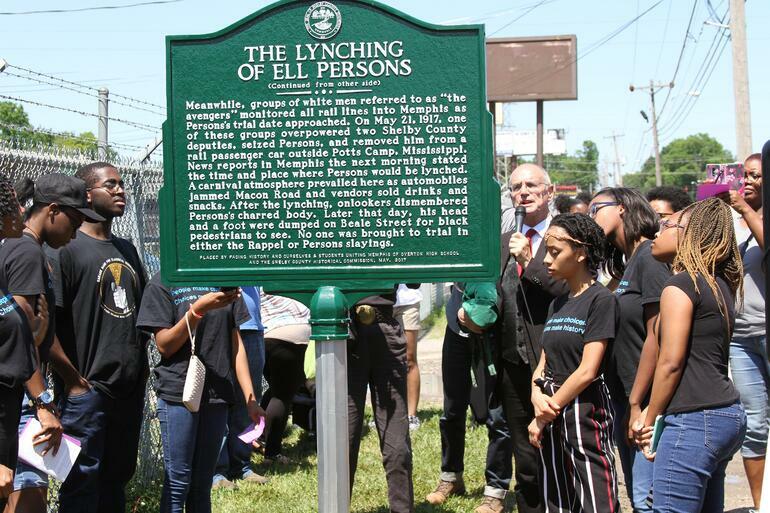 "The most exciting and most hopeful aspect of the Lynching Sites Project’s work in the past year has been seeing Memphis-area high school students become involved and to witness their understanding of how important it is to uncover the previously hidden history of lynching in our community," says Randall Mullins, co-founder of the organization. And the students at Overton High School did just that: Until last year, the story of Ell Persons had been buried deep within the roots of Memphis’ history. They uncovered the tragedy through a research project for their Facing History class. The students were shocked that his lynching happened right around the corner from the drive-in where they frequently hang out with one another. They didn’t want the research project to end with this new information. So together, with the help of their teacher Dr. Marilyn Taylor, they started SUM. And it’s moving beyond the walls of Overton. The students have partnered with their peers at Central High School, joining forces to plan the commemoration. The Facing History Student Leadership Group, comprised of students from 15 schools led a community teach-in at White Station high school in the spring. Over 200 community members participated in learning about not only Ell Persons but also the culture of lynching during this time period across the United States. The experience has helped students like Bowman push themselves beyond their comfort zone to be true upstanders. She and other members of SUM have actively visited churches, youth groups, and business to ask for support and to help spread awareness about Ell Persons and the mission of SUM. Initiative, there were 20 terror lynchings in Shelby County, TN from 1877-1950. Ell Persons became more than just another untold story of a black man killed, says Bowman. He became a symbol of hope for her and her peers. And so, they accepted the challenge to be upstanders—commemorating this dark moment in their community’s history and dedicating themselves to bringing forth a more compassionate future. Now, thanks to the students of SUM, Memphis has a permanent acknowledgment that there once was a man named Ell Persons. His legacy will remind the community for generations to come that they have the power to change the world around them for the better. Want to learn more about the legacy of lynching in the United States? Explore our unit, "Emmett Till: A Series of Four Lessons," which accompanies the documentary film, The Murder of Emmett Till. You can use all four lessons together or use them individually. The third lesson in this series, "Connecting the History of Lynching to the Murder," provides historical context of lynching and the early struggles against Jim Crow and racism.